The Emerald Blues (エメラルドブルース, Emerarudo Burūsu?) is an Emblem Heartless that is found in Kingdom Hearts II. An Emerald Blues uses Aero magic, although the spell does not appear in Kingdom Hearts II as it did in Kingdom Hearts, and the damage it deals is calculated as Other-type damage. An Emerald Blues has a smooth, conical, turquoise or aquamarine body with a Heartless emblem emblazoned on its chest. The top of its body flares outward and forms a jagged "collar" below the Heartless's spherical, pitch black head. It also wears a conical, light green hat with a jagged brim and a thin, curled, sky blue tip. 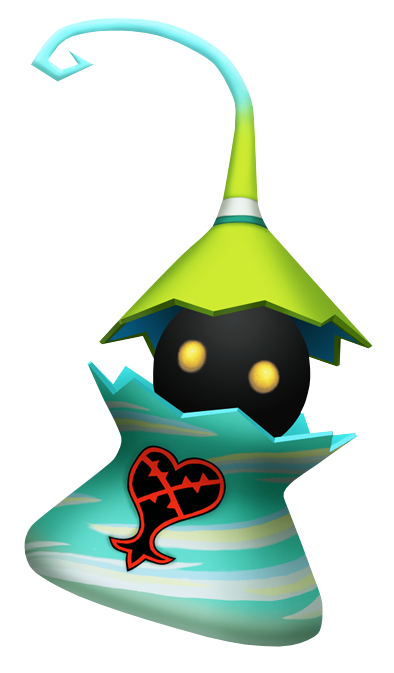 Like many Heartless, the Emerald Blues has glowing yellow eyes. Its seemingly useless feet sport three small, thin toes. The Emerald Blues, like other members of its family of Heartless, has a name comprised of a color and musical term. In this case, the color is emerald, a shade of green, and the term is blues. Accordingly, the Emerald Blues has shades of blue and green in its coloration. An Emerald Blues as it appears in Halloween Town in Kingdom Hearts II. An Emerald Blues as it appears in Space Paranoids.